Check out our latest feature in Aerospace Manufacturing and Design by reading below, checking out the May print edition, or clicking here. Position-flexible swing clamps; Twin-column materials testers. The Tsugami B038T combines the precision, accuracy, and speed of a high-performance Swiss-type lathe with the flexibility and additional rotary tool capability of a turning center with a turret. Up to 13 tools on the tool posts, plus 32 stations on the turret combine to machine complex parts in a single setup. 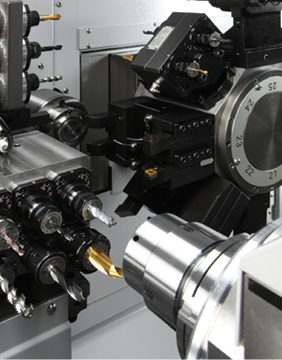 The B038T turning center performs seven different types of simultaneous machining operations – such as heavy milling, turning, drilling, tapping, hobbing, and long thread whirling – involving the front, back, and cross spindles.